If you need reliability and don’t want to pay too much for plinking ammunition this is a great choice. 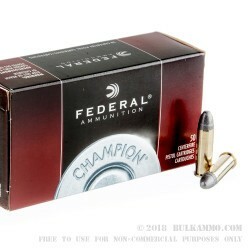 The Federal Champion line is a versatile offering with a history of very good performance and is available at a sweet price point. 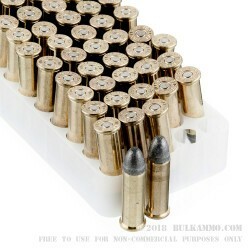 This is an all lead based round and features a 158 grain projectile that moves a bit slower but offers superior target impact and is very good for shooting reactive targets out of a revolver. Federal is one of the largest producers of ammunition in the world and the diverse lines and products it produces have a single philosophy in common: that they should be produced at the highest level of quality because the end user needs to count on their ammunition every single time. 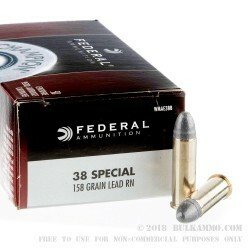 The state of the art facilities, no matter how old fashioned the round design is, produces top tier ammunition and they are making a great round for very little money out of this .38 Special variant. 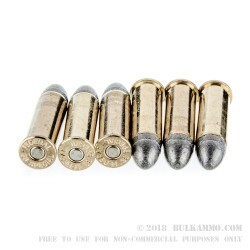 This is a top quality brass casing that houses the all lead projectile, and with the Boxer primer, it is very easy to reload and offers a nicely performing round for your revolvers.